I have never blogged or really ran consistently before but I figured I should probably start with a bit of history as to why I am doing it and who I am. So I am not a great writer so if anyone reads this well kudos to you and thanks! I am a 29 year old women (dreading the big 3 0) living in the city just trying to be successful in everything I do like mostly everyone else. The past years has had its ups and downs… This last couple months have had many more downs. Rather then sitting here having a pity party i’ll give you the brief version of it all. The tipping point for it all was well… The Tip! So minuscule right! (Finger tip anyways) Well when you are missing two very important people you and you are missing a little part of your body that consistently hurts it turns out to be quite the challenge. It also puts you in a big funk which I truly don’t recommend staying in for long. A wise man once told me “It’s not all about you” so wallowing in self pity is not a solution! I decided that I wasn’t going to let myself stay in that sad self pity funk I was in and as a goal orientated person I decided to do it in steps through running. The process of coming to this really doesn’t make sense to me. I did run a 5k with my family in October for my Grandma who had breast cancer, I struggled the whole race and without my sister I don’t know if I would have finished it. That’s a slight exaggeration but I didn’t enjoy myself so I don’t know why running seems the answer to everything right now. Even though every part of my body hurt look at how much fun we look like we are having! Here is my thought process on the whole running a marathon process! Although the run wasn’t per say FUN, it was for a good cause. I also know a lot of really great runners and they swear by it. 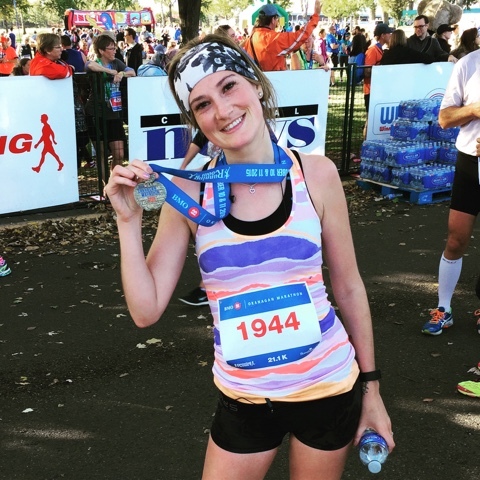 My cousin is a Doctor who took up running and that was a big part of her life even adding some life experience to her resume helping her get into Med School. She has even ran the Boston Marathon! She still runs and has a really great life. I am seeing a potential correlation between success, happiness and running. And really do you ever hear anything bad about being active? I don’t think so! To top it off it is almost summer and a little extra vitamin D is never a bad thing. I am also really lucky to have a great side kick! One of my friends has got on the same train as me and will be running with me and potentially training for a marathon (I haven’t really told him that’s the end goal… I’m hoping to ease him into the idea of it). He is really great and supportive so I am sure he will be game. Plus he will make sure I stay motivated and show up to our 7 am runs! Our plan is based on a plan my wonderful Aunt lent me along with a book for reference. She learned to run doing this plan and is a good runner and one of the best people I know! (Another point behind the running kick) We are progressively increasing our run (starting at 23 minutes) and doing it 3-5 days a week for now and working up to 5 days no questions asked! The first official run is a 5k on May 10th for Mother’s Day! We are going to use this day to do something positive! Both my parents lost their moms over the past couple months which was really hard however neither of them would want us to be sad. My parents also both like to run so my family is going to do this one together! My mom is also a touch competitive so anything we do together is always interesting. I also have two younger sister and a younger brother who are going to try to be here to run as well! My one sister lives in the same city as me so she has no choice. She is always a good sport though and a good runner so its not that much of a pain to do! And we cannot forget my trusty partner in crime who I am still in the process of confirming for this race. I am assuming he will do it though, he is a champ! This run raises money for the Neonatal unit at the hospital which is another area that is close to our hearts as my younger sister who is now 27 lived there for the first couple years of her life. I believe it is really important to give back to the community as well so every run I do will have some link to that. I’m working on the details in between but end goal in the Scotiabank Marathon in 2016. I know it’s a long ways away but I don’t think you understand how out of shape I am! This marathon helps over 400 charities too! Well that’s a little insight into me and the journey that is up ahead. I’m really into quotes so I will share my motivational quote for the day often and post pictures through this whole running adventure! Quote of my day from the one and only Pinterest: Don’t stop when you are tired stop when you are finished! Well here is to Day 1! Wish me luck!